As it’s valentines day this weekend I thought I would do a valentines based makeup look. I have done my usual makeup base (see here for details) using my Mac studio sculpt foundation mixed with the Rimmel Wake me up foundation, among other products. For my eyebrows I have used Benefits brow zings to outline and fill in (have a look at subrosabassil’s blog for the perfect eyebrow tutorial!). This look is all about the lips. As they are very bold I keep the rest of my makeup fairly minimal to avoid that ‘crayola’ look. Although I have done a light smoky eye as it is an evening look. For the eyes: I have used my Naked 2 palette by Urban Decay, Rimmel Scandaleyes felt tip eyeliner and Max Factor False Lash Effect Mascara. First I use ‘Bootycall’ over my whole eyelid using my real techniques brush. I then use ‘half baked’ over the upper half, in the crease and just above the crease of my eyelid- winging it out and up slightly. To finish I’ve used ‘busted’ in the outer corner of my eyelids, in the crease and lined my bottom eyelashes with it. Next I lined my lash line with the liquid eyeliner and create a slight wing. I also lined my bottom lashes with the eyeliner. Lastly I added 2 coats of False lash effect mascara. 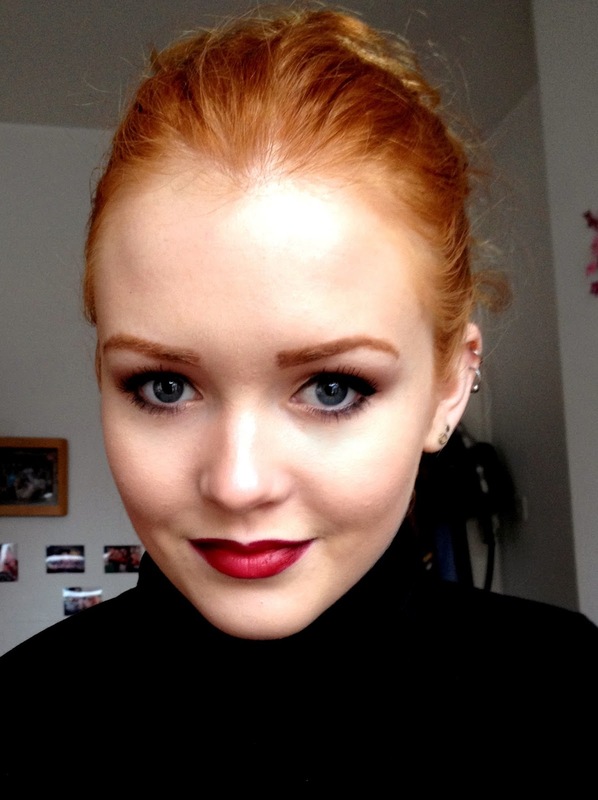 For the lips: I have used a black kohl eyeliner pencil, Mac in ‘so chaud’, Mac in ‘diva’ and Kate Moss in 101. First I have lined my lips with the eyeliner and shaded in the edges. I then use a lipstick brush and my Mac lipstick in Diva to go over the top of the eyeliner and blend together. Next I used the Kate Moss lipstick over my whole lips blending from the middle outside so as not to drag the dark colour all the way to the middle of my lips. I used my Mac in ‘so chaud’ in the middle of my lips to add extra highlight.